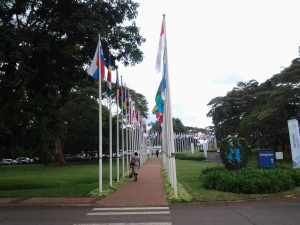 The 26th session of the UN Governing Council. 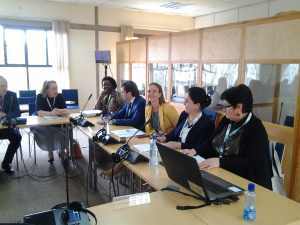 FIG Vice President Diane Dumashie attended three partnership meetings in Nairobi, Kenya to maintain engagement and strengthening relationships for FIG with key International partners. In May 2017, Vice President Diane Dumashie attended three partnership meetings in Nairobi, Kenya to maintain engagement and strengthening relationships for FIG with key International partners. The NUA recognizes urbanization as a strategic issue for development at national sub-national and local levels and consolidates the vision of urbanization as a source of development. Importantly it is now timely to move from adoption to action, which is well articulated by the theme of the 26th session “Opportunities for the effective implementation of the New Urban Agenda”. The sub-themes for the GC26 are important to the FIG agenda, and include: Towards inclusive, sustainable and adequate housing for a better future (1),Synergies and financing for sustainable urbanization (2) and Integrated human settlements planning for sustainable urbanization (3). 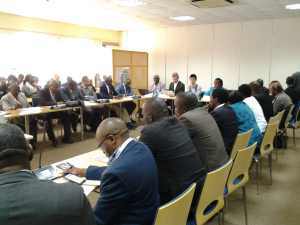 Together member country states and relevant stakeholders met in Nairobi to work to discuss define and adopt concrete ways and actions for the implementation of the NUA. Noting that participation in the GC is open to all, including parliamentarians, civil society organizations, local authorities, professionals and researchers, academia, foundations, women and youth groups, trade unions, indigenous peoples organizations, financial institutions, and the private sector; as well as organizations of the United Nations system and Intergovernmental Organizations. The GC is an intergovernmental decision-making body for UN–Habitat. It meets biennially and reports to the General Assembly of the United Nations, particularly on programmatic issues. Accordingly, other key issues to be discussed at this meeting includes; the activities of UN-Habitat, including coordination matters; review of the outcome of the third United Nations Conference on Housing and Sustainable Urban Development (Habitat III); and the work program and budget of UN-Habitat for the biennium 2018-2019. 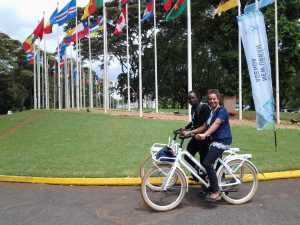 Notwithstanding, a hectic schedule of meetings, the UN, in keeping with the NUA agenda and principles of sustainable transport provided cycles to delegates to move around the UU Habitat complex . 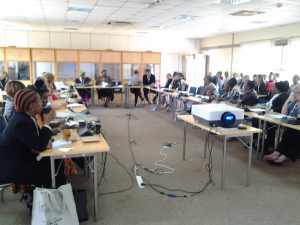 The Gender Forum - attended by over 50 people, where representatives of a range of women’s networks shared their experiences, importantly, highlighting the importance of also engaging men in collective efforts to achieve gender equality. Vice President D Dumashie highlighted the existence of an emerging UN- Habitat Action Framework designed to be used as a means to implement the NUA. And pointed out that the recognition by UN Habitat of the central role of women provides a true opportunity for women to continue the very good work. This is often undertaken in discrete spheres; i.e. at grassroots, professional and government officer circles, now is a time to listen, engage with one another by combining our efforts across the spectrum of women’s activities and to work together to ensure the implementation of the urban agenda. The third formal meeting involved FIG Vice President D Dumashie, representing FIG, as a member of the Habitat Professional Forum (HPF). 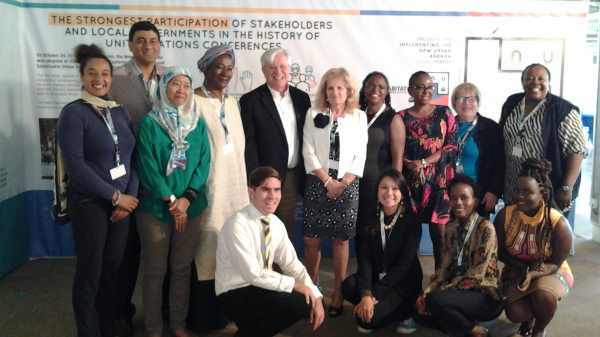 This meets at each GC, and provides a special forum for professionals involved in land and property disciplines to meet, propose and implement activities at UN Habitat platforms such as GC’s World Urban Forum events and make recommendations to the Executive Director of U N Habitat. The meeting agreed a strategy of working for the next 2 years and to hold an event at the next UN Habitat World Urban Forum scheduled in February 2018, to be held in Malaysia.